The first death caused by a self-driving car occurred on May 7, 2016, when Joshua Brown’s auto-piloting Tesla plowed into a truck at an intersection in Williston, FL. It was a horrible accident. The vision sensors on the Tesla apparently failed to “see” the truck, which was painted white. The story was reported online, on cable news, in newspapers – just about everywhere. Interesting, isn’t it, that when just one self-driving car crashes, it makes front-page news, when millions of crashes involving cars driven by humans garner much less attention? But let’s set that aside for the moment and review what the NMVCCS tells us about what kind of accidents are happening, and why. There are three reasons for accidents, documented separately in the NMVCCS report. Would self-driving cars cause more, or fewer, driver-related accidents, assuming that the “driver” is the car itself? It is hard to predict exactly, but it seems possible that a growing number of self-driving cars, with the ability to “read” traffic lights and road signs and respond appropriately could outperform the drivers studied. One thing for sure? Self-driving cars would not fall asleep, which could eliminate the 7% of accidents caused by non-performance errors. Would self-driving cars cause more, or fewer, accidents caused by vehicle failures? It is hard to predict exactly, but it seems likely that modern self-driving cars would be recently manufactured, hence less prone to accidents caused by problems with tires, brakes, and components that tend to fail on older vehicles that are still on the road. Would self-driving cars cause more, or fewer, environment-related accidents? It is again difficult to predict exactly. 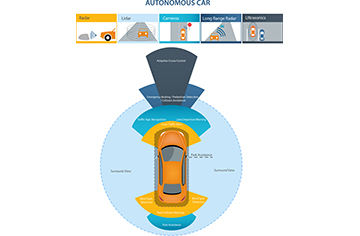 Although self-driving cars would be as susceptible to certain environmental factors as human-driven cars are, it is also worth remembering that a growing number of self-driving technologies under development can recognize, adjust, and alert other vehicles of adverse weather and road conditions. We are still decades away from amassing statistically significant data on the number of accidents that will be experienced by self-driving vehicles. Nonetheless, a review of the statistics reported in the NMVCCS presents a thought-provoking glimpse at how the safety of self-driving cars might evolve in the years ahead.